Time, Attention, Direction is what is needed to raise a well- adjusted, confident, happy puppy and the same goes for a child. That is just the beginning in raise amazing, loving, outgoing, well-adjusted puppies. As puppies grow and advance so does the socialization program. Begins with the eyes opening and ends when they are first startled upon hearing a noise. This week is characterized by the rapid development of motor skills. Puppies become more active and prefer to leave the nest to eliminate. Continued noises are part of the puppy's lifestyle; TV playing in the back ground, music, talk radio, and soundtracks with outdoor, construction, nature noise play during the day. Toys are introduced. Family and friends hold, and play with the puppies. A covered draft free corner with top is provided for the puppies sleeping quarters. All puppies senses are working well. Mom slips out a little longer. Puppies entertain themselves by play fighting with each other and enjoy making barking noises. Puppies discover puppy food is something to eat. Fresh water is always available. Their mother is still providing milk. Different noises are always being introduced. Puppies have a variety of romping areas which include the kitchen, the living room and the puppies enjoy the outdoors on a cement covered patio. Family and friends are having fun playing with the puppies. Puppies enjoy being in the arms of humans. Puppies appetites are increasing. Play is becoming much more fun with each other and the puppies are enjoying their toys. Noises, lots of loving, different locations are still part of their daily life. Puppies are separated with at least one other puppy in one of the different pen locations. One on one puppy time continues. A puppy may be in our laps while we are watching TV, reading or the puppy is being carried by us while we are doing chores. Dog's lacking proper stimuli during the developmental puppy stages may become over excitable, frightful, shy, fearful and may learn slower. The dog's behavior may evolve into a variety of destructive habits. While in our care puppies are exposed to a wide array of smells, textures, surfaces, sounds, vibrations, tastes, sights, locations, and lots of different people have provided time and attention holding and talking to the puppies. Our puppies have experienced trips to the vet, meet new people, go for rides in the truck, learn how to walk on a leash, learn to walk up and down stairs, ride on a cart at their home and at Home Depot. Puppies are in a wire cage. They will continue to be introduced to new objects, sights, and sounds. Crate training begins. All of this and more will ensure that all of our puppies make a smooth transition into their new homes as a well-adjusted happy puppy. When you take your puppy home socialization must continue to insure the puppy's development stages needs are met. More and more stores welcome pets. My favorite locations include; Pet Smart, Pet Co, Home Depot, Lowes, Feed stores, Bass Pro Shop and outdoor shopping malls. 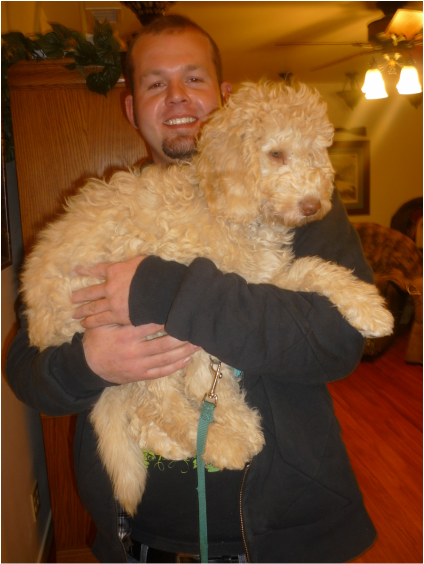 The puppy that I keep is also taken to the vet's office a few times a month to get weighed. Free of charge. I walk in. Sit down. This allows the puppy to absorb the smell and sights. I weigh the puppy. I sit down. Puppy's attitude and acceptance lets me know when it is time for me to leave. Weaning should be complete. The mom will continue to play with and teach her puppies. Puppies are also introduced to other family dogs and cats. Socialization with other animals is an important part of puppy's socialization process. Note: Dogs shake hands by sniffing each other's rear end. If you are out with your puppy and a dog comes to greet, pick up your puppy and turn the puppies rear end so the approaching dog can properly greet. If I find a dog is off leash or shows aggressive tendency, I pick up my puppy and I am prepared to ward of upcoming dog by lounging forward and stomping my feet, if more defensive is needed, I will shout out, "Shish", "No". Puppies up to 5 weeks of age have very little sense of fear and will approach and investigate anything and everything. Puppies fear gradually increase through the 6th week and naturally escalates toward the end of the 7th week. That is why we introduce so many noises and objects in their daily life prior to this stage. Most agree that this is the wrong time for puppies to be released to a new home, have harsh discipline, or have anything traumatic happen in their life. House breaking begins and the pups learn to eliminate outdoors. Puppies learn to be groomed and bathed. Clicker training is introduced. Puppies begin to learn how to sit and stay. Puppies are encouraged to follow our voice and spend time out doors with us. Puppies are rewarded for eye contact. Learning at this age is permanent. Routine of staying in differentt locations while being in crate or playpen continue. Puppies are used to be separated and rejoining litter mates. Puppies spend time with their mom in the kitchen or being outside with her. The mother has weaned her puppies and does not allow them to nurse. Puppies continue to enjoy playing with other dog members. Puppies crate training continue, house breaking continue. Puppy's good behaviors are positively reinforced. 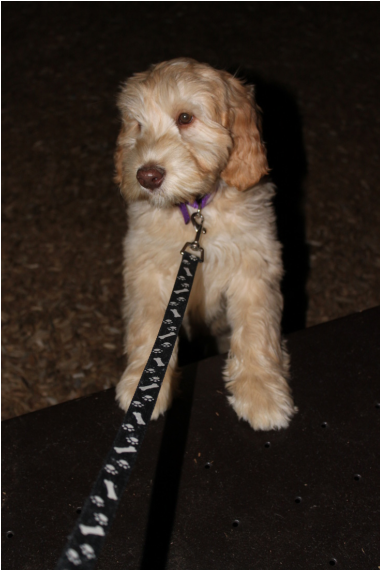 Puppies are leash trained and enjoy outings. Puppies sit and stay is continually being reinforced by clicker/treat training. Puppies are becoming more acceptable to their environment. 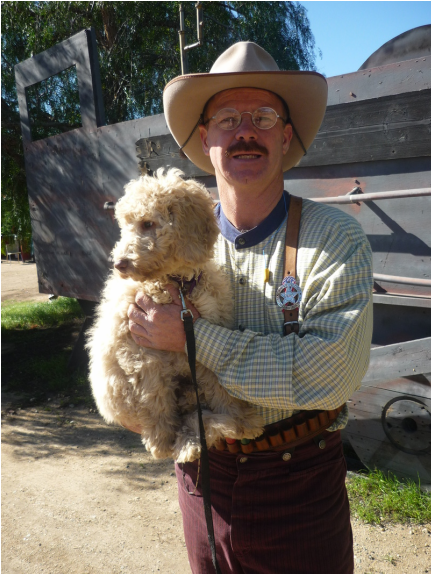 Patients, being calm and easy going are great attributes to have when working with puppies. Puppies continue to be curious however they are still cautious. Allow time for the puppy to sniff, look at, or absorb what is happening in its surrounding. Provide no tension on leash. If a puppy gets startled, do not give attention. Allow the puppy to gather its wits and continue on. Puppy approaches something without fear, praise. Note: We comfort our children when they are distressed or scared but we do not comfort our dogs. 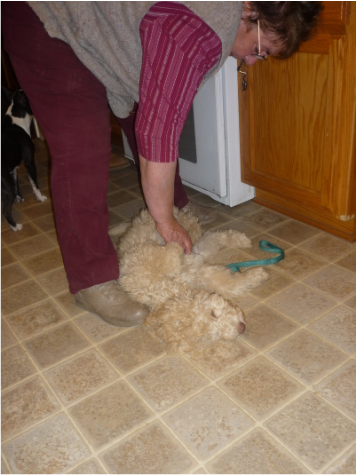 We allow our dogs to get over their discomfort on their own. I have walked by objects 10 to 15 straight times before the puppy realized it was not going to get harmed. I did not provide puppy with any praise, affection or words. I am not rewarding for a behavior I do not want to imprint. The," Dog Whisper" is earning millions of dollars to teach humans that they own a dog and a dog is not to be comforted as if it is a child. Praise and reward for only the behavior you want to be continued. IMPRINTING HAS OCCURED! Simple as that! Puppies are released to their new homes. If extra training is requested puppies will stay longer. Puppies start to learn the right behaviors for the right time. They pay more attention to their humans and are very busy learning about their new world. Enjoy, love and take your puppy lots of places. It is a lot of fun to continue to reinforce the puppy socialization training. If you want to go to the next level, I suggest purchasing a book on positive enforcement training which also includes the clicker training philosophy. Australian Labradoodles are very smart, intuitive dogs. They are very easy to train and they only want to please their human owner. If puppy is an open pen it is important to have three corners covered to reduce draft. Think of always having a shelter/cave for puppy to get out of draft. That is why we all put a doggie bed against a wall and better yet in a corner or next to a solid piece of furniture to reduce the draft. Clean water source is very important. You want easy access for the dog to lap up water. Change water often. Clean the water bowl often. Fresh water is so important. I feed dry dog food. I do not suggest pouring new food on left over dry dog food. I will take the left over and moisten with water and add meat, fish, or cheese meat/ juice from left over cooking. The dog loves and no waste. Sun: It is important that the puppy has an opportunity to absorb sun rays. The sun helps with the puppies bone growth. Always have a place where a dog can get under shade if left out doors. Dogs can handle the cold better than they can handle the heat. Note: Dogs cool down by their tongue, belly and feet. Hot summer days, I hose down the cement and have very large water containers. Oil pans work well for small dogs and growing puppies. If they get warm they cool off by walking in the water. Some Australian Labradoodles just loves to play in the water. I have enjoyed watching them while they are having so much pleasure with their water experiences. This is the age of independence. The puppy begins to test leadership and dominance. "Temper tantrums' may occur. Puppies that have been compliant may begin to have an opinion of their own. This is a critical period of learning for the puppy. This is the time when attending puppy class is essential. The exposure to other puppies, other breeds, other sizes is critical. The puppy will learn the difference between play and work. An environment with lots of distractions helps build self-confidence. Most behaviorists/trainers believe that the end of this period (14-16 weeks is also the closing of the "window" of effective socialization). Your puppy has been through an amazing socialization training program since the day it was born. Your puppy is very advanced compared to puppies not receiving this time of imprinting training. If you are not able to attend a puppy class then attempt to take your puppy out several days a week. It could be a short walk down the street, or a short car ride to a park or store. Exposure, exposure, exposure is the key ingredient. Only reward acceptable behavior, by praise, petting, and use happy voice. Do not allow unacceptable behavior. The commands that can be used are Shish, and Aye, for unwarranted behaviors. I rarley use the word, No. Suggestions: Picking up puppy. I gather leash. Bend over, place my hand under dogs belly and I say the puppies name, and I say, "UP". This prepares the dog that a change is going to occur. They are being lifted. Car loading: The car door is open. The crate or wire cage door is already open. I pick up puppy, instructions above. I stand in front of the open crate for 10 -20 seconds. I say the puppies name and then, "All Aboard". Training process begins for loading puppy. Car Unloading: I open back car door. I stand in front of crate, cage, or harness for 10- 30 seconds. My objective is to keep puppy in position until I give the release command. I open crate, My hand palm is open saying, dogs name, "Stay", I then grab the collar, snap on leash, and keep a gentle stern hold on the puppy not allowing it to move forward. While I am petting the pup, I am waiting for at least 30 seconds. The longer the better. I place hand under belly, and say the dog's name and say, "OK". I pick the puppy up and take out of crate. I hold puppy for 10- 30 seconds. Then I put puppy on ground unless I choose to carry. This training could make a difference of having control of your puppy (growing into a dog) while getting in and out of a vehicle. The owner should have full control. The puppy/dog is not making the decisions you are. Unfortunately, there is a high percentage of dogs that bolt out of the car and end up getting hit by a moving vehicle. It's is tragic. Simple training will eliminate a potential hazard.